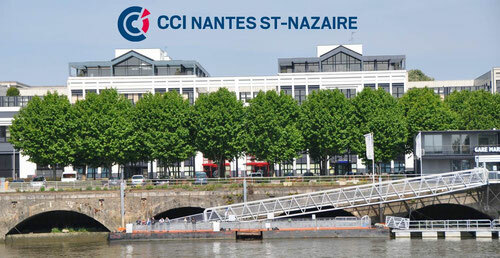 The CCI Nantes St Nazaire is located in the city center of Nantes and on the Loire river bank. It is closed to Nantes Atlantique International Airport and to Nantes railway station. The "Gare Maritime" tram station (line 1 direction: François Mitterand) is adjacent to the CCI Nantes St Nazaire. For those arriving by car, there are free parking (P1, P2) (Just say that you are coming for the symposium in the entry phone). Just 20 minutes from the city center, Nantes Atlantique International Airport links Nantes to the principal European cities via a dense international and domestic flight network. With more than 30 scheduled routes most of Europe's capitals are less than 2 hours away! From Monday through to Saturday, a shuttle bus runs between the airport and the city center every 30 minutes from 5.30 to 23:15. The Tan-Air shuttle bus takes you in front of the airport's Hall 1. A 26 min ride will bring you to the "Commerce" station where the tram (line 1 direction: François Mitterand) will bring you to the "Gare Maritime" station (3 stations from the "Commerce" station) adjacent to the CCI Nantes St Nazaire. Tickets: 7.50 €Tickets can be purchased in the shuttle. Fares from the airport to the city center range from 30€ - 35€ (prices supplied for information only). Travelling by train is comfortable and easy. The TGV brings you from Paris Montparnasse to Nantes in 2 hours. There are 21 regular TGV departures per day with two direct links per day to and from Roissy Charles de Gaulle Airport (Paris). In front of the north exit of the Nantes railway station, take the tram (line 1 direction: François Mitterand) until the "Gare Maritime" station (6 stations from "Gare SNCF" station) adjacent to the CCI Nantes St Nazaire.